The airport (Lentoasema) - Helsinki-Vantaa is about 30-45 minutes away from the city centre. Honestly, don't bother with a taxi, pre-booked transfer or any of that, just hop on the 615 bus which departs from a stand just outside arrivals. Cheaper than a taxi, the bus deposits you on the main Railway Square (Rautatientori) where you can choose to walk to your final destination or transfer to another bus/tram for your onward journey. Helsinki isn't a budget destination and unless you're going for a hostel or a B&B, lodging is going to be a fair chunk of your outgoings. If you're into designer chic, a reasonably priced "independent" hotel is the Helka, which is just behind the Kamppi centre. Slightly away from the centre of the action, it's within spitting distance of all of the main attractions and the Kamppi Metro Station. 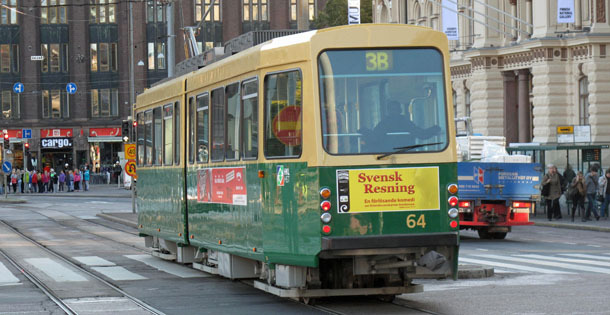 The Paasi which is short tram or metro (3-5 minutes) ride out of the city centre, located in Hakaniemi. Boasting a "story" feel to it, it has three different styles of hotel room based on themes. It's a bit kitsch to some extent, but still great fun, and the service is excellent. It boasts two lovely restaurants too! The Grand Marina is also short tram ride (3 minutes) from the city centre on the "island" of Katajanokka (connected by a bridge). Housed in a former warehouse, a maritime/insdustrial feel filters through the public areas, and while the standard rooms feel a little small, it really is a sympathetic conversion of an old building with all the mod cons you would expect from a large business hotel. Breakfast is served in the Makasiini restaurant, and as this is a big hotel you may find this very busy at times. Harris tip: get down there early to guarantee a seat, or head into the bar after collecting your breakfast! Finally, the Park, located opposite Hakasalmenpuisto (a park, hence the name) in the Töölö district. This hotel occupies the building of the former Intercontinental Hotel, and at the last time of visiting (January 2014) it was under renovation to bring it up to Scandic standards. It's a short trek/tram ride out of the city centre, but its park/lakeside location offers some fantastic views across Helsinki from the upper floors if you can get a front of property room. If you do choose a Scandic hotel, my advice is to sign up for Scandic Friends, their frequent guest programme as, despite what the website says, even the "First Floor" receives a bar/restaurant voucher (€6 I think) for each night you stay and after clocking up 5 nights, that increases to €12. With all Scandic properties, the room rate includes breakfast and prices tend to increase the later you leave your reservation. So; those are some of the basics; more to come shortly.